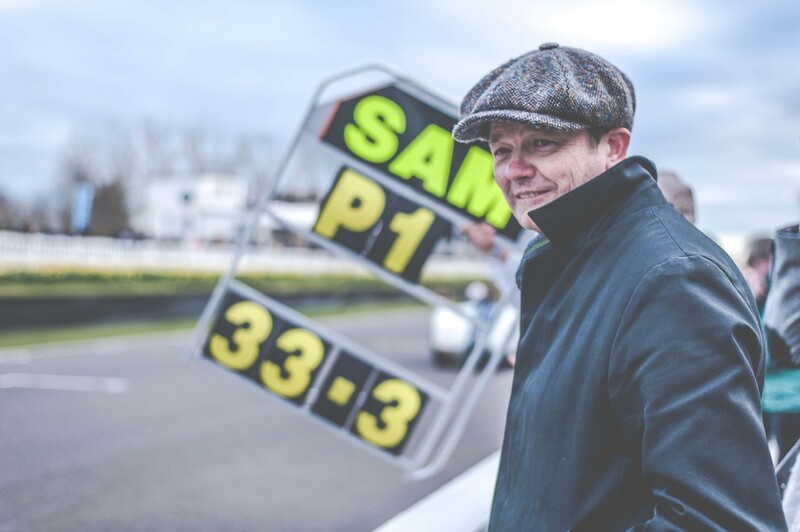 For the second year in a row, professional racing driver and historic car specialist, Sam Hancock, swept to victory at this year's season opening Goodwood Members' Meeting winning the Peter Collins Trophy for drum-braked sports racing cars from 1948-1955. Invited again to pilot Ben Shuckburgh's fabulous Cunningham C3/C4-R, Hancock mirrored his previous performance in the car (back in 2014 at the Revival Meeting) by qualifying on pole position - this time however, a full 2.8 seconds clear of his nearest challenger. After heavy delays following earlier accidents, fears of a cancelled Peter Collins Trophy race were abated when the cars set off just as dusk descended. In bitterly cold but dry conditions, Hancock lead the pack into the first corner after a strong get away. 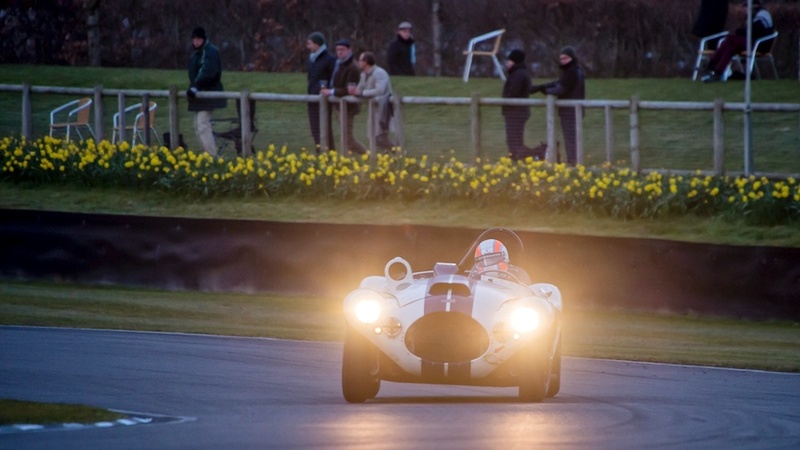 Headlights glowing under a deepening red sky, the throng of twenty seven 1950's sports racing cars from famous marques including Jaguar, Ferrari, Maserati, Aston Martin, Frazer Nash and Allard thrilled shivering spectators with a clean but enthralling fight.
" This is by far the most enjoyable way to win a race. I'm such a lucky chap getting to drive all these wonderful cars, but in this case, it belongs to my mate who has put in blood, sweat and tears to even get this car to the grid. It's a thrill to drive, a great challenge, and the car and its owner deeply deserve this victory. I couldn't be more happy to be the one to deliver it. 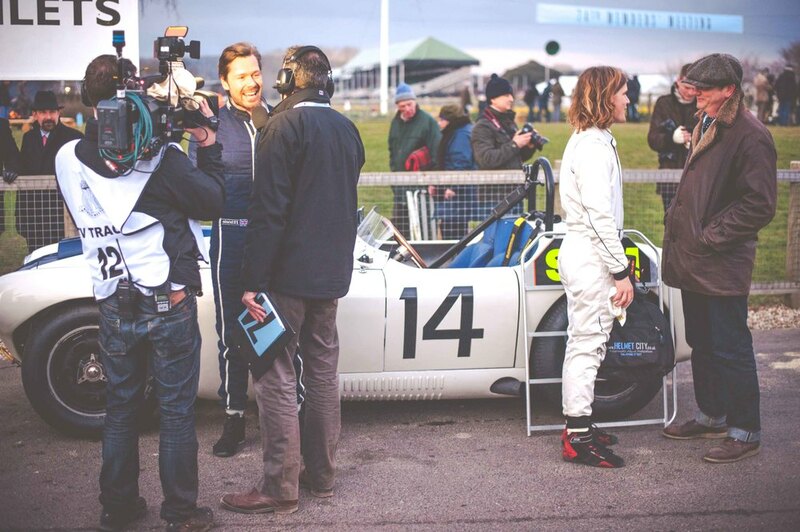 The most sincere thanks to Ben for trusting me with his pride and joy, and to Lord March and the Goodwood team for what will certainly be a most treasured weekend of memories."